Can we just take a moment to say how much we loved working with her?? For her big day, Anita chose a gorgeous fitted Allure Bridals gown, with unique lace and sparkle throughout! It’s a showstopper, as you can see! Anita is Macedonian and has some seriously fun wedding traditions! As she got ready for the day, her family, the groom and his family were outside having the time of their lives! Traditionally, they barter for the bride to come out of her home. They present the bride with her shoes and fill them with money so she may have a prosperous future. Afterward, the groom leaves so the bride can exit the family home for her last time as a single woman. Also because Anita deserved to have some fun too! The ceremony was held at Sts. Peter and Paul Macedonian Orthodox Church in Crown Point! In Macedonian tradition, the engaged couple chooses another couple to be their godparents. Anita’s godmother played a very big part in the ceremony. As Anita and Eric circled the altar 3 times, she stood behind them and threw candy to indicate a sweet future together. After the ceremony it was time to really get the party started! The reception was held at the Croatian Center in Merrillville. Guests definitely satisfied their sweet tooth - the centerpiece on every table was a tower of cupcakes and a popcorn bar was ready and waiting for everyone to dig in! The tradition didn’t stop at the ceremony. During the reception, a roasted pig was presented by the groomsmen to the godfather, who paraded it around the room as guests made it rain cash! The pig was then served to the bridal party and family. Then there’s the bread dance - which is literally people dancing with bread. Here’s the backstory on this tradition: a loaf of bread made by Anita’s godmother is presented during the first regular dance of the evening. It symbolizes the two families coming together. Guests pay to dance with the bread, which is then cut up and passed out to everyone! At the end of the day, all of the money collected throughout the course of the wedding is given to the newlyweds! I mean how fun is that?! Let’s learn a little more about the newlyweds! How did they meet? 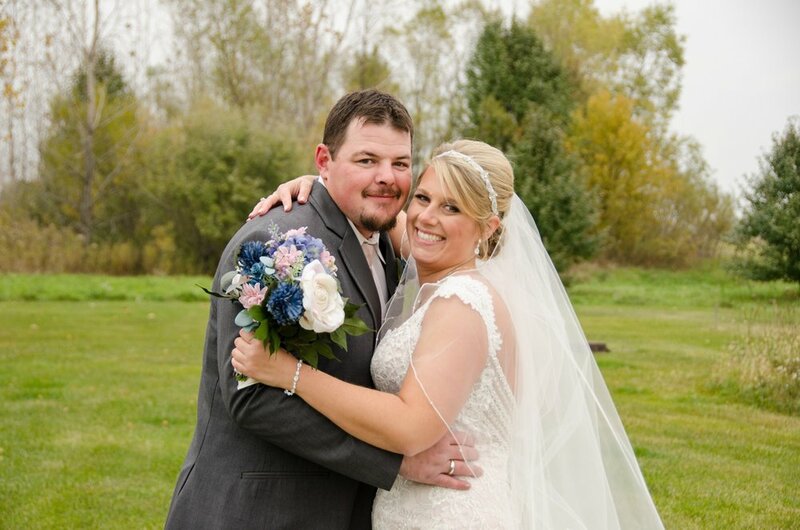 “Eric and I met at Calumet Harley-Davidson. I was the girl who was selling t-shirts and he a customer. After a few times chit chatting, we realized we knew a lot of mutual friends. We would end up seeing each other throughout the region hangout spots. We would talk when we saw each other and always said hello, but it wasn’t until one day we started messaging on facebook….you know how every true love story starts….that we really got to know-know each other. The rest is history! Facebook is quite the matchmaker! “Last year, we were planning to celebrate Christmas with his side of the family a week early. We got up that day (Sunday) and I made breakfast. Just a normal Sunday morning and I was starting to wrap presents to take with us. He goes into our bedroom for a little while and comes out with a wrapped little box that was about ring box size….I FROZE! He left it on our TV stand and just went into the shower and doesn’t say anything other than don’t open it. After his shower he tells me to wear an ugly Christmas sweater and he was going to wear an ugly vest. “My dress buying experience was my favorite part of the entire wedding planning process. I just felt so relaxed. Everyone at SBB was so helpful and honest and most importantly, they listened to what I wanted. I knew when we got engaged that I was only going to shop at SBB. A lot of my friends and family members had shopped with SBB and I was so surprised that Sandy remembered me every time! She is absolutely the best! What was Anita’s favorite part of the planning process? What was Anita’s favorite moment from her wedding? Any final advice for future brides? “Give yourself more time than a 10 month turn around on wedding planning! Congrats, Anita and Eric!!! Thank you for sharing your beautiful day and special traditions with us! Check out more pictures from their big day in the gallery below!